I fear that this dish takes me one step closer to getting a Texas-State-Fair-style reputation as one who fries things that aren’t meant to be fried. But, dear reader, this is so. good. And it’s really an adaptation of a classic Jewish-Italian recipe, so it’s legit. Here artichokes are trimmed and quartered and then dropped, sans batter, into hot oil. The result is a real testament to the power of frying. The stem and heart of the artichoke become golden and tender, while those delicious leaves take on a crispy, potato chip-like quality that cannot be beat. This must, must be served with a slice or two of fried lemon, which is really just one of the most beautiful things in the world. A crispy, intensely-lemony delight. I served this on a chickpea puree featuring gremolata flavors, but if you’re in a hurry you could definitely skip this step and just serve these on a plate with a smear of Greek yogurt. Make the chickpea puree (recipe follows). Cut one of the lemons in half and squeeze the juice into a bowl of water. Set aside. Prepare the artichokes. With your hands, peel off the tough outer leaves of the artichoke. keep peeling until you start to see pale green tops on the remaining leaves. use your knife to cut off the top third of the artichoke (not the stem end). Use your knife or a vegetable peeler to remove the tough outer layer of the stem, and trim off any rough areas around the base of the stem. Cut the artichokes in quarters and remove and discard the feathery choke. Put the prepared artichokes into the bowl of acidulated water. Heat the oil (it should be about 1 inch deep) in a large pot over medium heat, until shimmery but not smoking. (you can put the handle of a wooden spoon into the oil- if bubbles form around the base, your oil is hot enough). Dry your first 4 artichoke quarters as best you can with a kitchen towel and ease them quickly into the oil. Be careful! Remaining water may cause the oil to splatter. Let the oil settle down a minute before you attempt to poke and prod the artichokes. Then fry, turning occasionally until the artichokes are golden and tender. Remove from the oil and drain upside down on paper towels. Sprinkle with sea salt while the artichokes are still glistening with oil. Repeat this step with the remaining artichokes. Slice the remaining lemon into very thin slices, and remove any seeds that cling to the slices. Pat the slices dry with paper towels and then drop them into the hot oil. Fry, turning occasionally, until the insides of the lemons are golden brown and the outsides are bright yellow. Drain on paper towels. To serve, spoon some of the chickpea puree (or a smear of greek yogurt) onto a plate. Drizzle with olive oil. 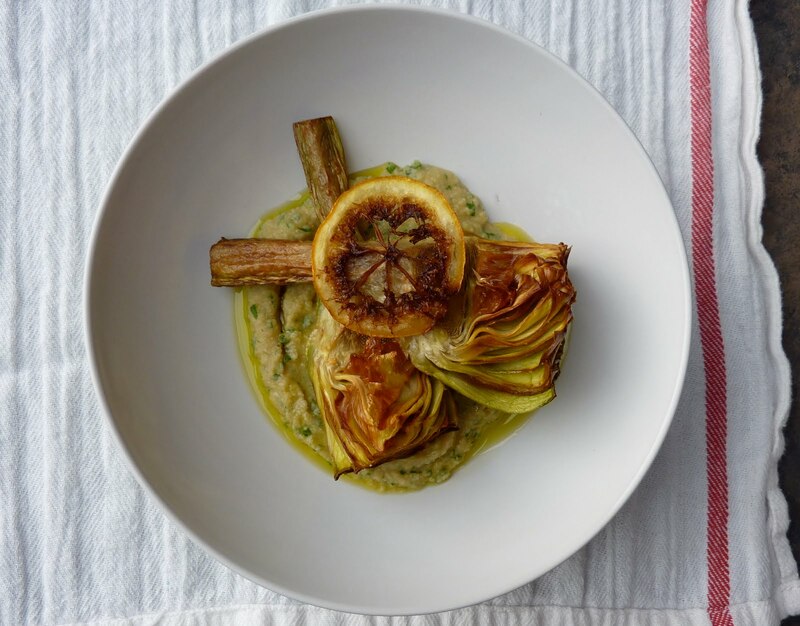 Top with two artichoke quarters and a slice or two of fried lemon. Enjoy! Put all ingredients except parsley into a food processor and process until smooth. Toss in the chopped parsley and pulse a few times to incorporate.